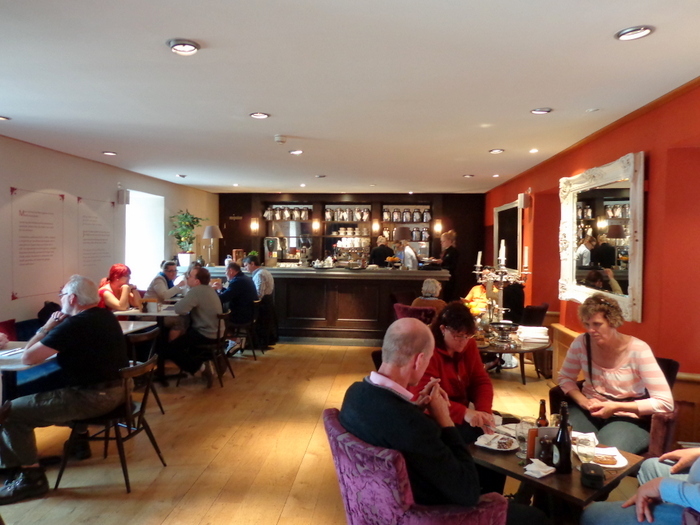 After a good nights sleep, we enjoyed a delicious included breakfast buffet in the hotel’s dining room. A large assortment of attractive breakfast dishes – both hot and cold – were offered. Our hotel is circled in red on map. Our first adventure for the day was to visit the castle. 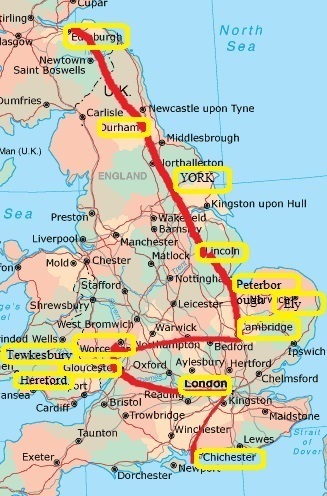 We were told about the route that did not involve steep climbs and steps - Castle is circled in green on the map. We made it in about 15 minutes. 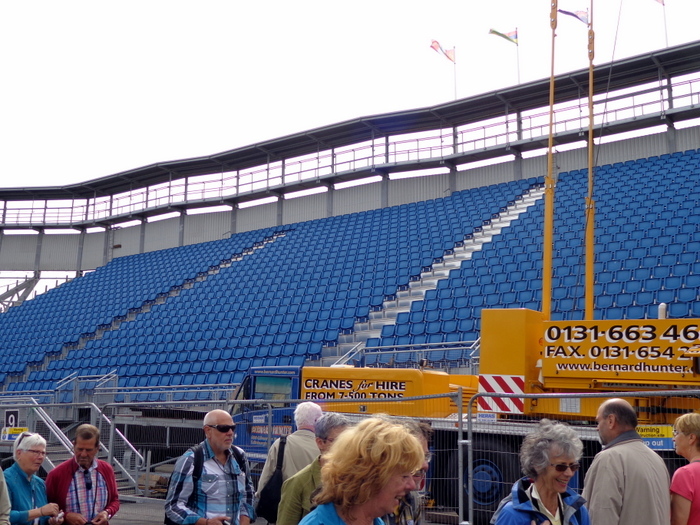 Upon entering the castle gates, we encounter construction crews taking down the huge number bleachers that are erected each year for the Tattoo, which takes place in August for 3 weeks. We had talked several times about coming here for it, but hotel rooms are all taken a year in advance. The British adopted the practice and it became a signal, played by a regiment's corps of drums or pipes and drums each night to tavern owners to turn off the taps of their ale kegs so that the soldiers would retire to their lodgings at a reasonable hour. With the establishment of modern barracks, full military bands later in the 18th century, the term Tattoo was used to describe not only the last duty call of the day, but also a ceremonial form of evening entertainment performed by Military musicians. 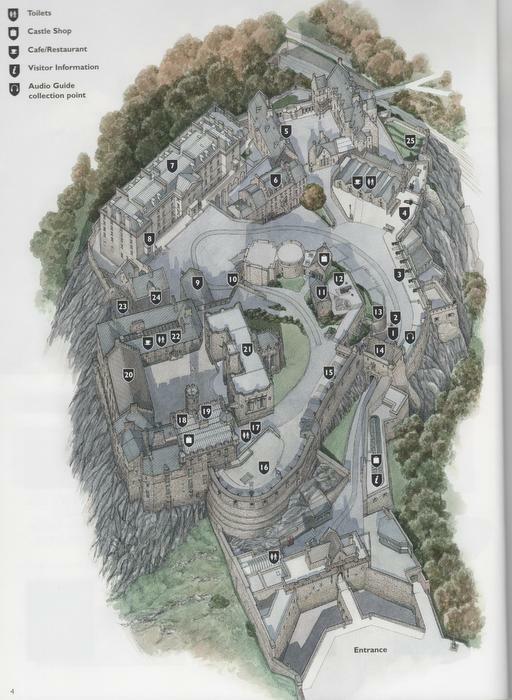 The welcome page in the official souvenir guide of Edinburg Castle describes history of the castle and these words: "Mighty Edinburg Castle dominates its city like no other castle in Europe. For 3000 years, humans have sought safety on the Castle Rock. 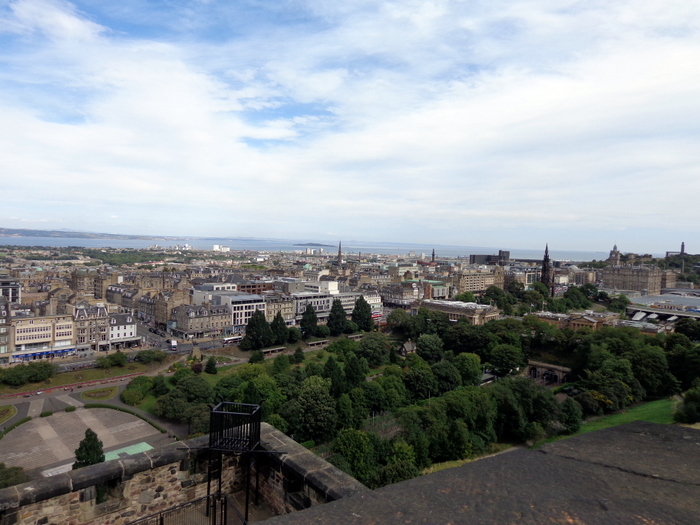 In ancient times they called it Din Eidyn,' the stronghold of Eidyn'. 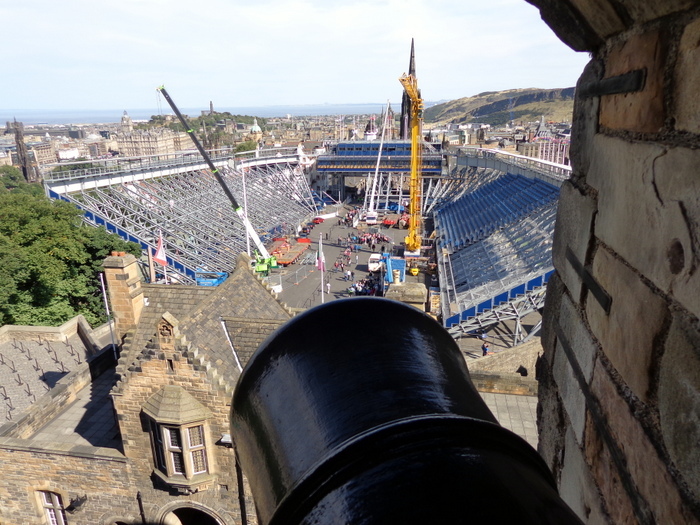 Then, around A.D. 638, the Angles invaded, and ever since the rock has been known by its English name – Edinburgh. In the Middle Ages, Edinburgh became the Scotland chief Royal Castle, and enduring siege after siege during the long wars with England. 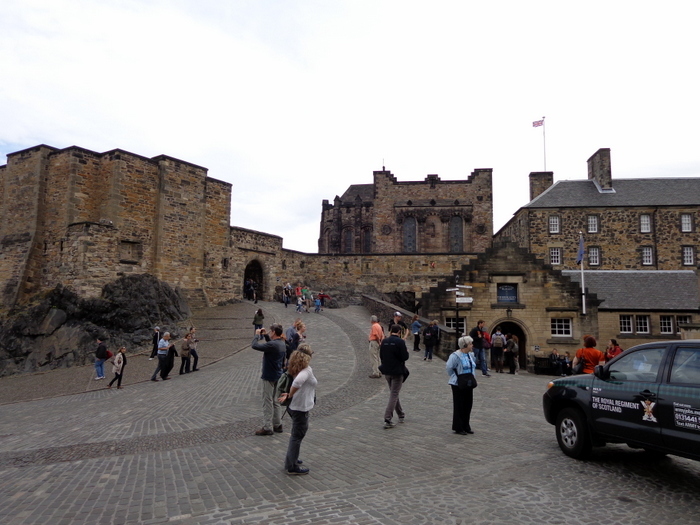 By the time of King James VI's birth here in 1566, the castle was little more than a garrison fortress. The Jaco bite siege in 1745 proved to be the last. Since that time, the ancient Castle has found a new role as a national icon, a major visitors attraction and a World Heritage Site. But the garrison of soldiers remain." 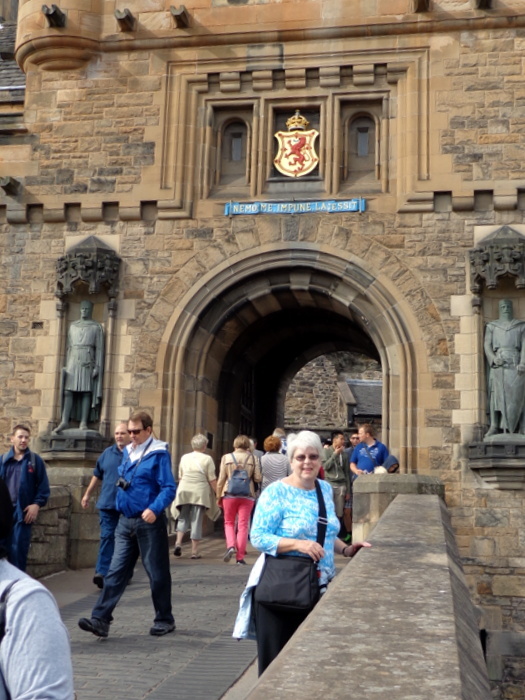 After passing through the area on the esplanade where the tattoo had taken place, we came to the main gate, then found ourselves in a long queue for entrance tickets to the Castle. Upon entering a second gate, we picked up our audio guide headphones. The tour wa s excellent with each building numbered so we could hear the narration on the audio guide. There are 25 buildings or places of interest on the tour. 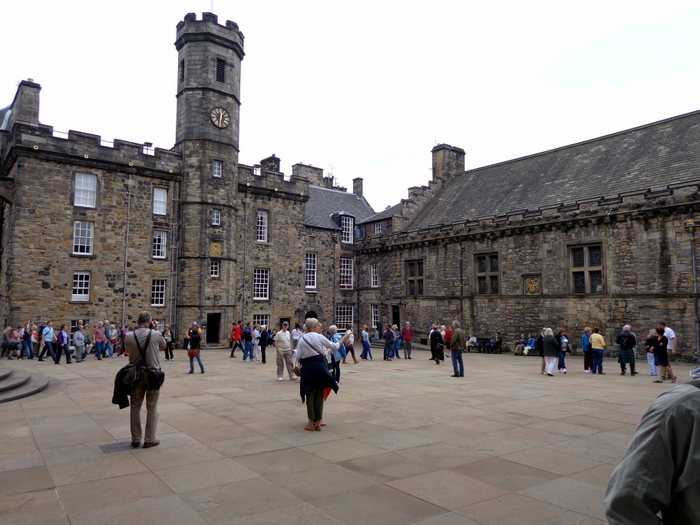 After climbing up a winding, steep road we came to Crown Square which contained four large buildings – the Royal Palace, a building housing the Scottish crown jewels, the Great Hall and the Scottish National War Memorial. The Royal Palace was the Royal residence in the castle. The last sovereign to sleep here was Charles I on June 19, 1633, the night before his Scottish coronation. 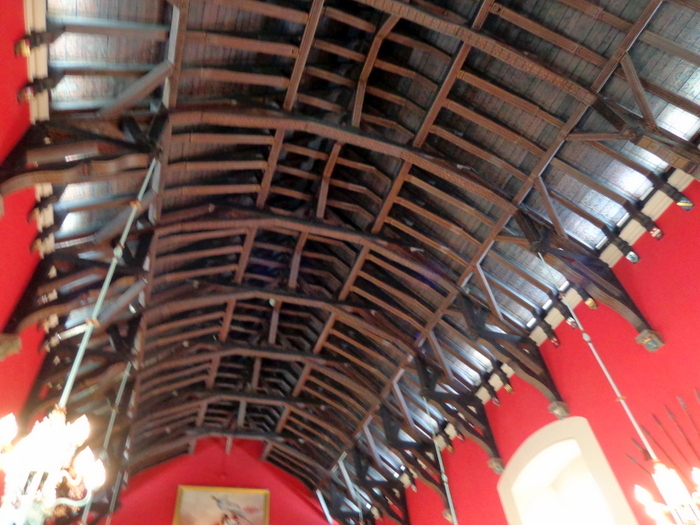 Another building of interest w as the great Hall which was completed in 1511. When Cromwell captured the Castle in 1650, he had the enormous space converted into a barracks for his troops. It remained in military use for the next 230 years. In 1886 work was begun to restore it to its former beauty. It is a magnificent room with a hooded fireplace at one and, a heavy Gothic timber entrance screen and panelin g and stained-glass windows , and the hammer beam ceiling which is one of the most important in Britain. Around the walls were displayed various swords. Another building in the Crown Square contained a delightful café where we enjoyed a delicious lunch. Afterwards we continued exploring the various buildings, one being St. Margaret's Chapel. This tiny church is the oldest building in the Castle and in all of Edinburgh. It was built around 1130 by David I as a private chapel for the Royal family, and dedicated to his mother, Margaret. The outside is very plain but the Chapel is lovely with a chevroned arch dividing the space in half, a chancel containing the altar and the rectangular nave. The tiny space is still used for baptisms and weddings. 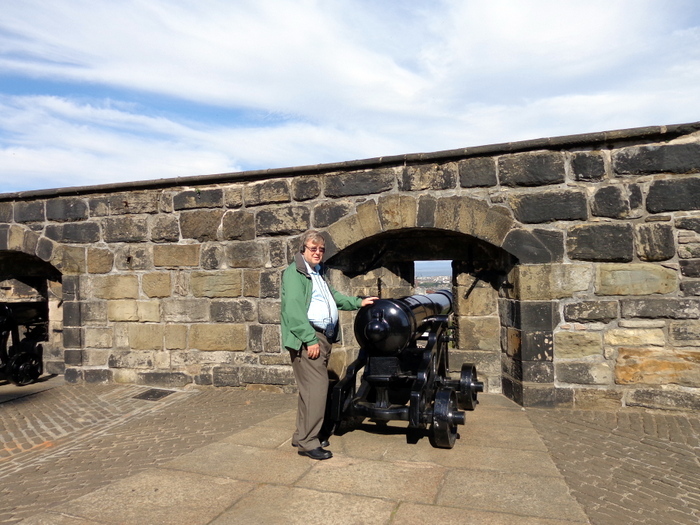 All around the walls were a number of cannons. Not only was the castle fascinating, but the views from all sides were spectacular and the weather was wonderful – very clear but a cool breeze. As we were going down the walk to leave, we asked a man to take our picture. We learned that a lady in his travel group was from Waldorf, MD -20 miles from where we live. He introduced her…..a small world! 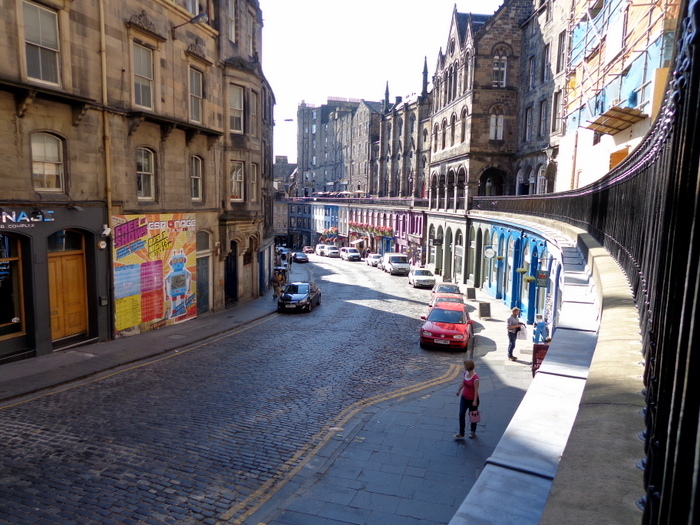 Not far from the castle is a street called Victoria Street. It is a two story street with a walkway about the street level shops. We have seen it before on some British TV show. One of the hostesses in the hotel told us about a shop where you buy an assortment of liquors and vinegar by various size bottles. The shop had large glass vats with liquors on one side and vinegar on the other. You would choose the bottle and the owner would fill it. We bought a small bottle of raspberry vinegar to take as a gift for a couple that we met in Cancun who have invited us to dinner at their house on Sunday night. Our next stop was St. Giles Cathedral circles in blue on map. 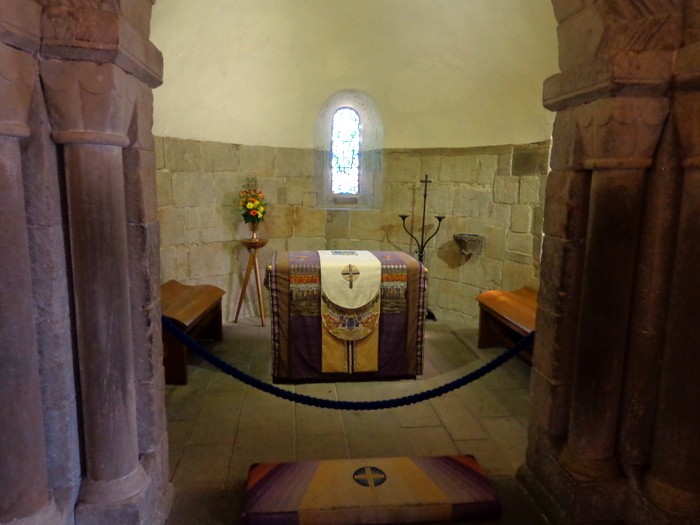 St Giles’ was founded in the 1120s when the Scottish royal family, the sons of Queen (Saint) Margaret and King Malcolm Canmore, especially David I (1124-1153) made strenuous efforts to spread Catholic Christian worship throughout the Scottish lowlands. This church was probably quite small, Norman in style with only a few traces of it surviving in the present building. In 1385, a much larger church of early Gothic style was partially burned. It was quickly repaired. The Scottish Reformation was part of the movement throughout western Europe which led to national churches breaking their ties with Rome. Its leader in Scotland was John Knox who was greatly influenced by John Calvin, the Reformer of Geneva. In 1559, Knox led the Lords of the Congregation into Edinburgh and was elected minister of Edinburgh. Knox played a principal role in establishing the styles of worship and administration that were to be accepted throughout the country. Knox served as Minister at St Giles’ until 1572. 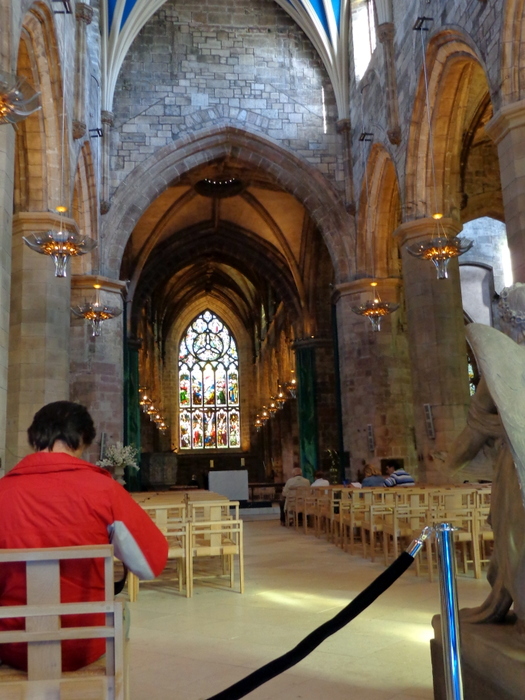 The Reformers partitioned the interior of St Giles’, dividing the congregation of Edinburgh and allowing the building to be used for a wide range of purposes. During the next 300 years the building housed a police station, a fire station, a school and a coal store. The Scottish guillotine, the “Maiden”, was housed in the church, and in one corner was a prison used for “harlots and whores”. The General Assembly of the Church of Scotland met in the building, as did the Parliament and the Town Council. For more than a century after the Reformation, worship in St Giles’ was disrupted by the disagreements about church government. In 1633, King Charles I appointed Scottish Episcopal bishops in Scotland and in 1635 William Forbes became the first bishop of the new diocese of Edinburgh, with St Giles’ as its cathedral, which it remained until 1638 and again from 1661-1689. That St Giles’ is commonly called a cathedral dates from this period. Over the next 150 years many chapels were added. 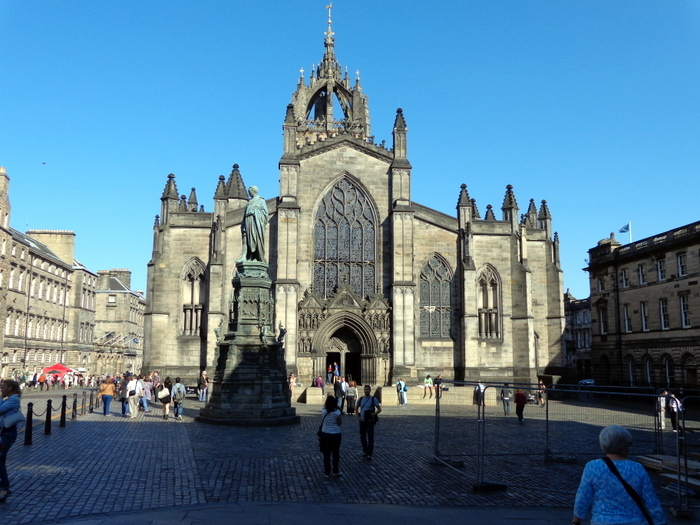 These included chapels set up by the craftsmen’s guilds of Edinburgh, chapels endowed by prominent merchants and nobles, and a chapel for a relic of St Giles. By the middle of the 16th century, there were around fifty altars in the church. By 1800, St Giles’ was in a poor state of repair. In 1829, architect William Burn supervised a restoration of the building which demolished some chapels and encased much of the exterior in a skin of smooth ashlar. 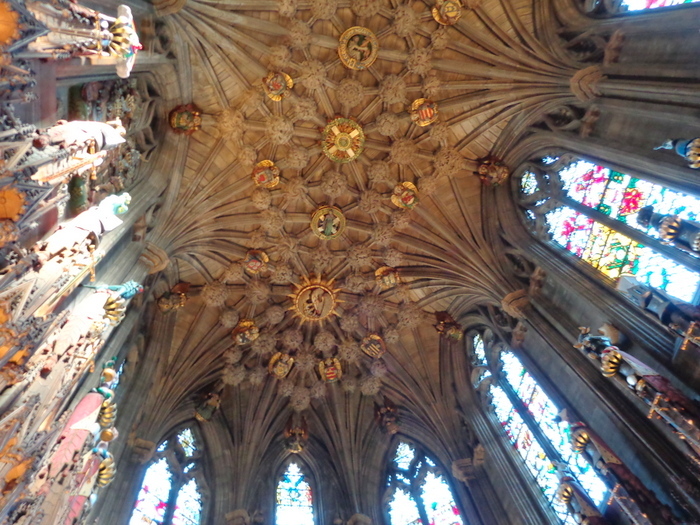 In 1911 the Thistle Chapel was completed, to be used by the Knights of the Thistle, Scotland’s order of chivalry. Though small, it is in 15th century high Gothic style and full of elaborate carvings in wood and stone and of colorful heraldry. The windows are huge and wonderful – some dedicated to such people as John Knox, Robert Louise Stevenson and Robert Burnes. 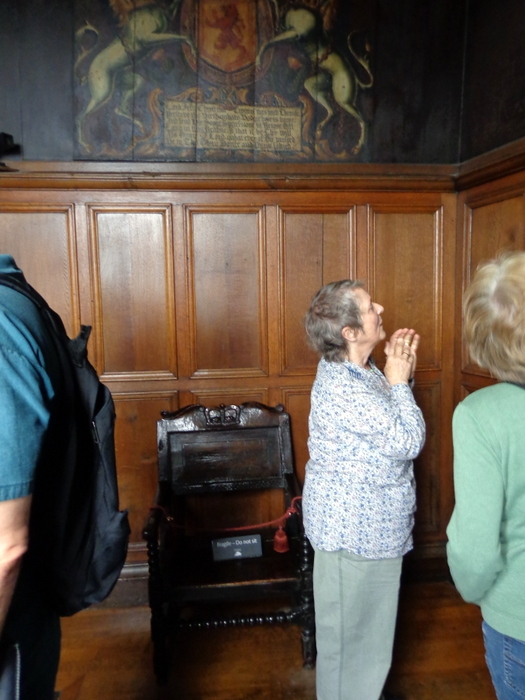 We had talked to a young man at the entrance desk and later he came back to the Thistle Chapel to tell us about it. 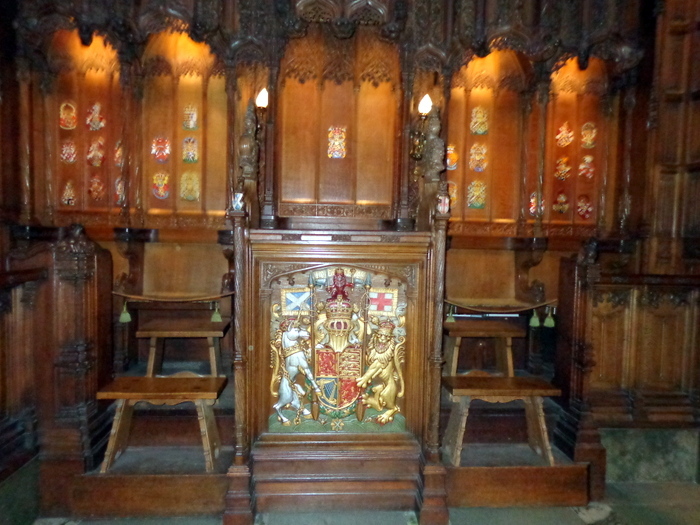 We saw where the Queen sits for the Royal Order of the Thistle. We found out that this young man was raised in Frederick, Maryland -another small world experience. By that time, it was about 5:00. We felt too tired to walk back to the hotel, so we took a taxi. We stopped at the hotel bar for a drink . We had the wonderful news that our luggage had arrived and was in our room. That made us very happy. We had a 7:15 dinner reservation at the Heights Restaurant - underlined in purple, several blocks away so we walked. 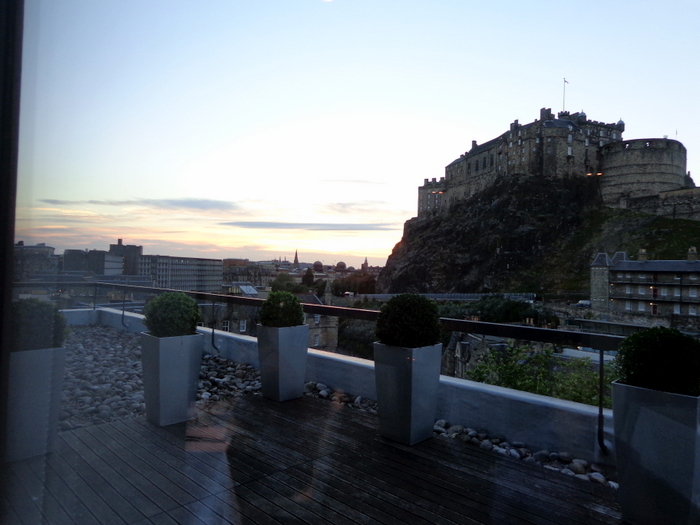 The Restaurant was on the 5th floor of the Apex Hotel. One side was all windows with views of the castle which was across several streets. We had an excellent dinner – Kathleen had beef and I had Cod fish. It was about 9:30 when we finished, so we got a taxi to bring us back to the hotel. We had a long day and are really tired.